With 2013 right around the corner, you should be aware of the following 10 items for your checklist to make sure you’re ready for the Affordable Health Care Act. 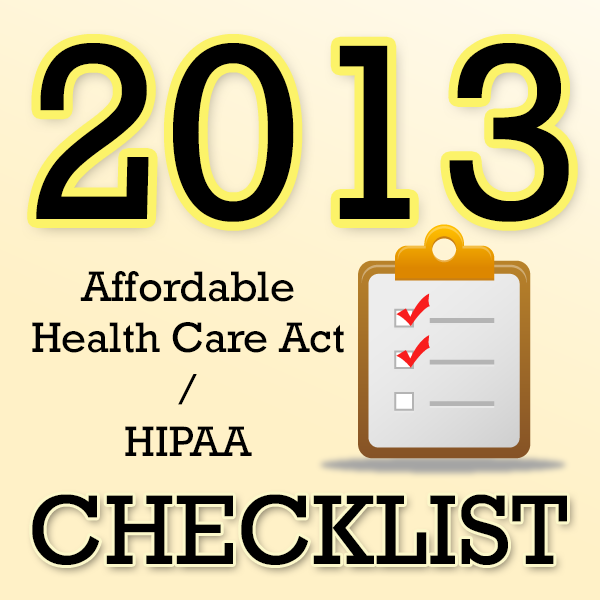 The following list itemizes the changes that generally will become effective in 2013. The effective date depends upon a number of factors, including whether the health plan is grandfathered, the first day of the plan year, and the number of employees. Details: Plans are required to provide in-network coverage with no cost sharing for preventive care such as coverage for contraceptives, contraceptive counseling, breastfeeding support, supplies and counseling, and screening for domestic violence. Details: The maximum amount that an employee can contribute to a health flexible spending account on a pre-tax basis cannot exceed $2,500 per taxable year. While the reduced limit is effective January 1, 2013 (or the first day of the plan year beginning after January 1, 2013 for plans with fiscal years), employers have until December 31, 2014, to adopt amendments to reflect this reduced limit. Details: The annual limit on the dollar value of essential health benefits cannot be less than $2 million. Details: The Forms W-2 issued by employers in early 2013 must report the value of any health coverage provided to each employee in 2012, regardless of who pays the premium for that coverage. Employers should take steps to ensure that payroll departments or payroll providers are prepared for the new reporting requirement. Details: Employer health plans must provide a Summary of Benefits and Coverage (SBC) to all plan participants, as well as to all employees who are eligible to participate. If the employer makes a mid-year change in the plan provisions that would change the terms of the SBC, the plan also must provide a Notice of Material Modifications at least 60 days before the change takes effect. Details: An employer is required to withhold an additional 0.9% Medicare tax on an employee’s compensation in excess of $200,000. The additional tax does not have an employer matching requirement. Details: Employers must provide a notice to employees concerning the availability of health coverage through the state-wide exchanges. The notices will explain some of the benefits and consequences to employees if they choose to purchase a qualified health plan through the state exchange instead of electing coverage under an employer-sponsored health plan. Employers are still waiting for additional guidance regarding these requirements, and some are predicting that this requirement may be postponed. Details: Employers who were providing retirees with prescription drug coverage that was generous enough to qualify for a federal tax subsidy will no longer be allowed to deduct all of those expenses. Details: Plan sponsors must begin to pay a fee (the “PCORI Fee”) to the Internal Revenue Service per average covered life ($1 for the first year, $2 for the second year, and increased as permitted in future years) per plan using Form 720. These fees will be used to fund the new nonprofit corporation, the Patient-Centered Outcomes Research Institute, to support clinical effective ness research. Some rules permit the limited aggregation of plans. Details: Group health plans must file a certification statement with HHS certifying that their data and information systems for the plan are in compliance with the HIPAA standards and operating rules for health plan eligibility, electronic funds transfer, health claim status, health care payments, and remittance advice transactions.